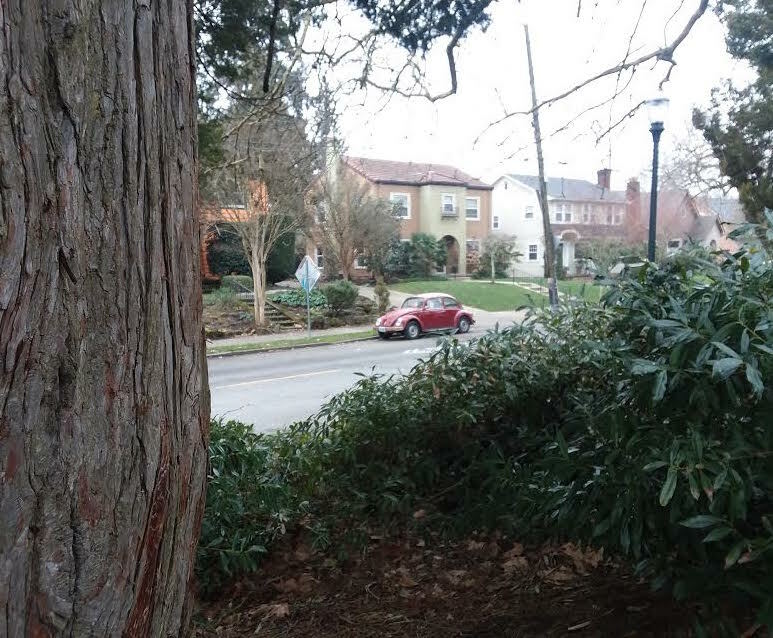 This is part two of Kellie’s review of “Walking with Ramona,” in which Kellie explores a neighborhood of “Beverly Cleary’s Portland” with the guidance of the book by Laura O Foster. As I stepped beneath the towering trees of Grant Park, grass softly crunching beneath my feet, mental note was taken of the soft, white flecks peppering my hair, scarf, and jacket. Snow was to be my close companion on this tour, with no apologies given. I smiled. 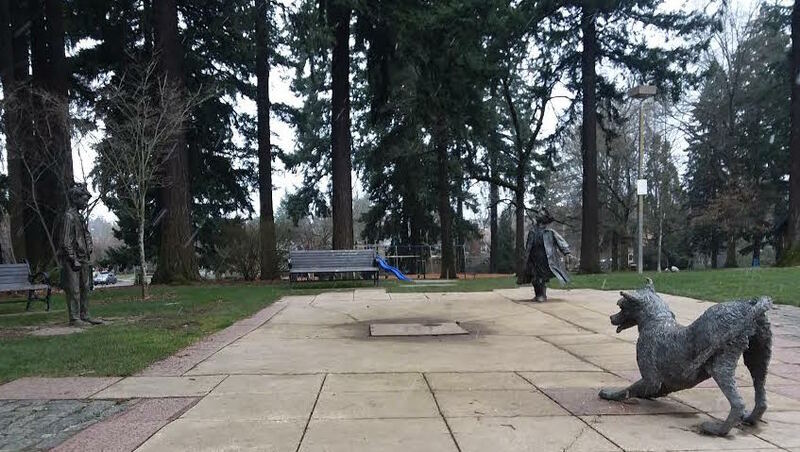 Was there not many a time Beverly Cleary herself had traipsed through this park on snow-laden days? To walk in the footsteps of my favorite author, whether in the thick of winter or the heat of summer, was an honor more than anything. The tour began on the west side of the park, near a towering sequoia. As I made my way there, several dogs with their owners greeted me near the off-leash area, complete with wet puppy kisses. Upon reaching (and passing) said sequoia, I noticed the first main attraction to my left: the Beverly Cleary Sculpture Garden. A life-sized Ramona gazed wistfully into the distance, with Henry Huggins and his furry companion Ribsy completing the scene. It’s a lovely little dedication by artist Lee Hunt, worth seeing up close and in person. 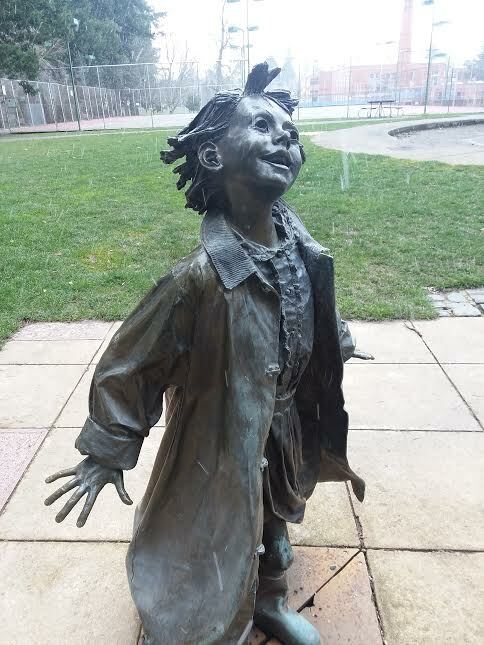 By this time, the snow was falling quite thickly, whipping the faces of all in the vicinity. Ramona didn’t seem to mind, though. Continuing on past the track and field section of Grant High, I took a gander at the homes peeking through the trees across the way. They are noted in the Walking with Ramona tour for being modeled after English cottages, and they are, indeed, quite charming. Having left Grant Park, I continued forward for some time until… oops! I’d gone too far! Doubling back so as to hook myself onto the right track, I soon reached the next marker. At the corner of Hancock and 33rd, a short pause became necessary, not just to get my bearings, but also to admire the residential area of Hancock Street. Its river of concrete traveled quite a ways down past more than one interesting set piece. But what’s this? 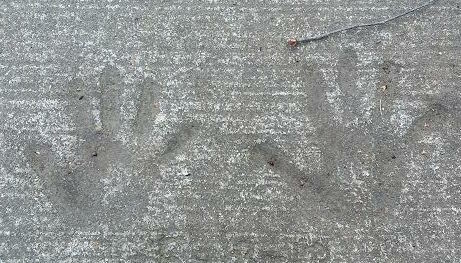 At my feet were little hand prints, stamped into the scratchy sidewalk. Seemed like the kind of mischievous thing Ramona would have done. 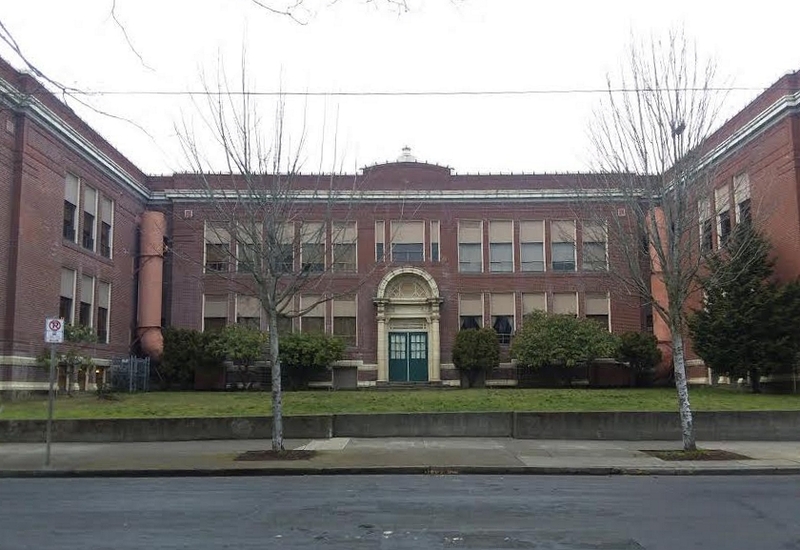 Across the street, on the right hand side, sat the Fernwood Grammar School, now sporting a new cognomen: the Beverly Cleary School. 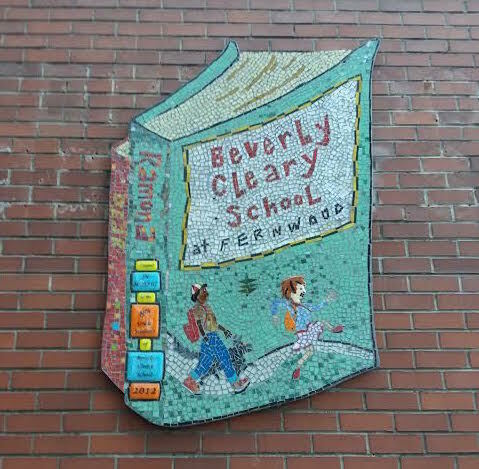 On the wall by the east entrance of the school rests a mosaic dedicated to said author and her books. Turning a corner to travel west on Hancock for a brief spell will reveal the arched entrance to the oldest portion of the school. What might young Beverly have thought as she made her way into the building for the first time? These days the green doors look out onto a small, grassy area. Something was pulling at me to kick off my shoes and run across the field for the pure fun of it. Maybe some of Ramona’s rascally nature was starting to rub off on me. Alas, I held back the urge and returned to the residential section, where a surprise awaited me…. 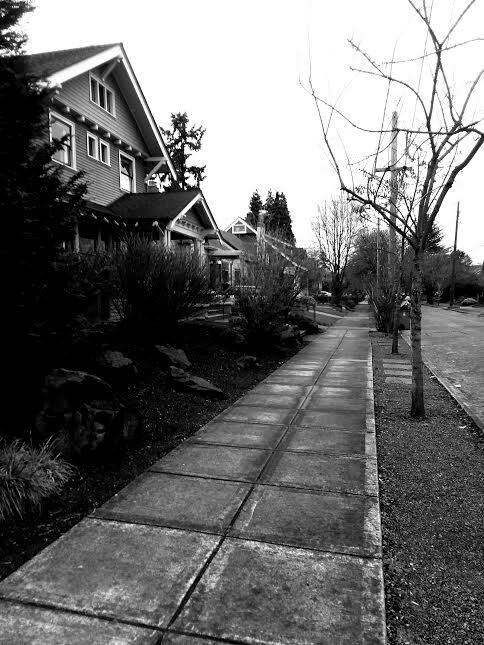 Down this street, on 3340 Hancock, rests one of Beverly’s childhood homes, the third (and last) that her family rented in Portland. It’s a quaint little thing, all decked out in a coat of red and gray, complete with a soft white and tan-colored trim. 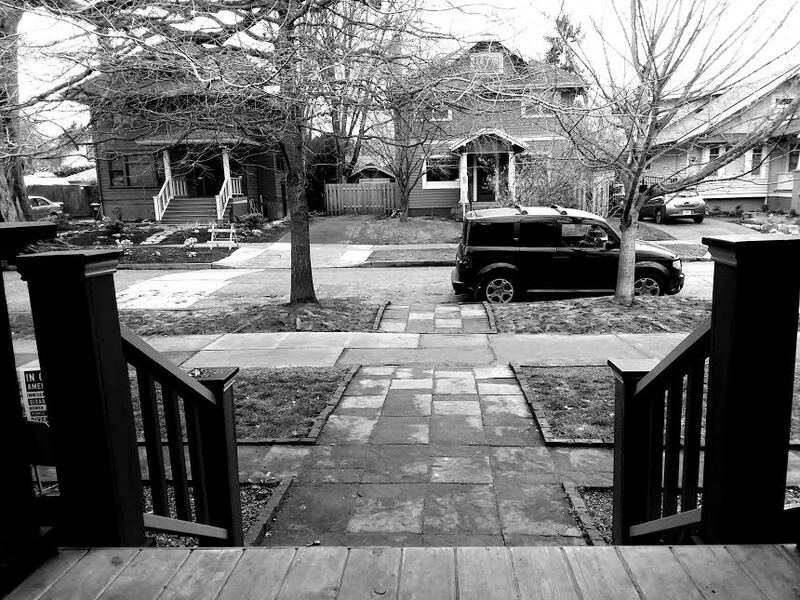 I admired the porch, in particular. This is where a young Beverly came out to do her needlework, and perhaps admire the towering elm tree across the way, its branches stretching impressively over the street in an attempt to grasp the rooftops on the opposite side. As timing would have it, the current owner of the charming abode just so happened to be outside, and he was kind enough to let me snap a few pictures, even giving me leave to access the porch! I was tickled to sit where Beverly once perched and catch a view of what she saw in the early 1900s. Perhaps I’d lingered a bit too long at the house, for the position of the sun was reminding me that time was of the essence. I had started the tour rather late in the day, and if this was going to be a complete excursion and not a half-baked one, it was time to get moving. 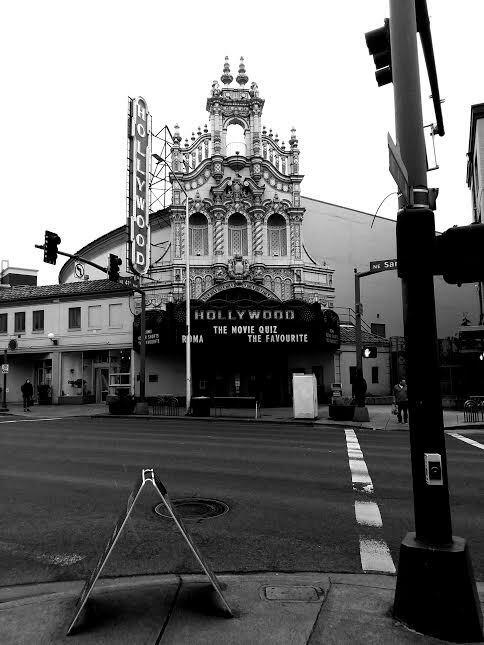 Making my way down town (traveling a little faster than I would have liked), my speedy feet came to a halt at Sandy Boulevard, the home of a very well-known resident indeed: the Hollywood Theatre. There she stood in all her grandeur, reminding me quite fondly of the old movie houses back home in Southern California. The theater has been here since 1925 and, hopefully, she’ll continue to be here for a long time. I must have looked like such a tourist as I kept checking the tour book for directions on where to go next, following its instructed path down Sandy to the corner of 43rd. Sandy Boulevard, as it turned out, had more surprises in store. More photos were to be snapped, it seemed, for directly on my right stood the oldest establishment still standing in the neighborhood. 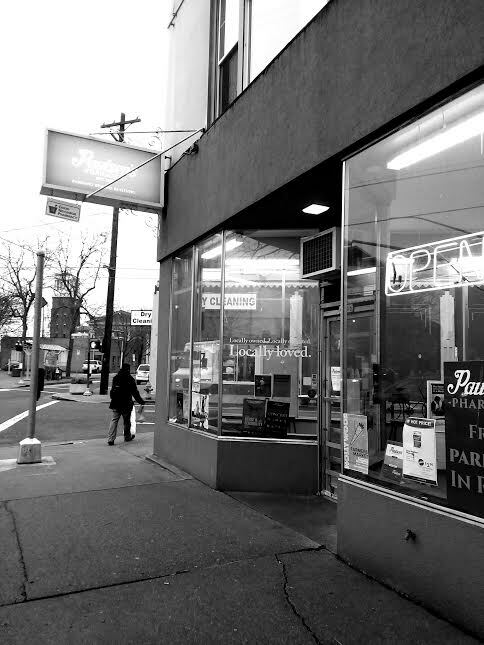 Paulsen’s Pharmacy opened its doors in 1918, and you can still pop in for an ice cream at the soda fountain from the looks of it. I imagined Henry Huggins, one of Beverly’s colorful characters, skipping by the drugstore on his way home. 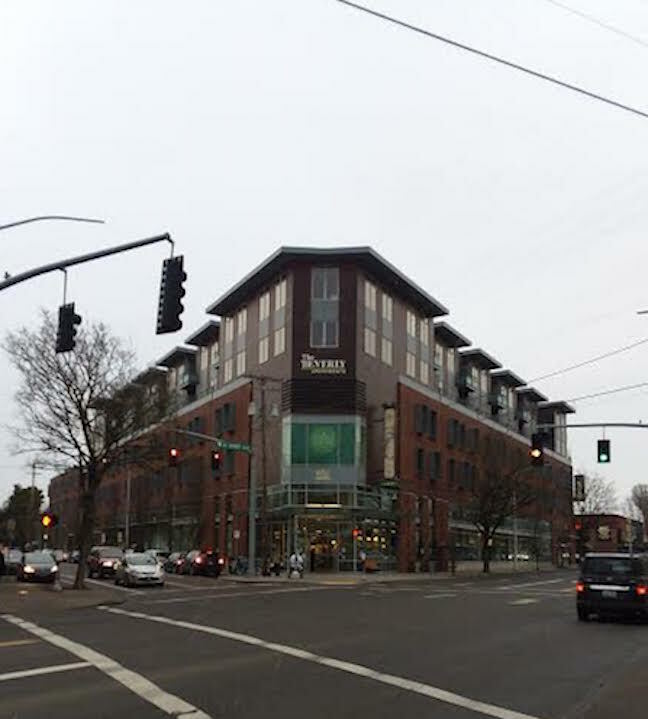 Directly across the street, proudly positioned in a corner, stood an enormous structure — part apartment, part Whole Foods Market — ironically named “The Beverly”. Why ironic, you say? You’ll have to read the book! Already the sun was starting to set. The snow had abated somewhat, but the sky was still bathed in gray… and getting darker all the time. One of the next hot spots on nearby Tillamook Street was the Hollywood Library, but this was a dangerous place to enter. Books are like candy to me. Once inside, I might never come out. Was it safe…? Tentatively, I took the risk and stepped past the doors. The warmth of the library was a great relief from the cold outside, and I certainly wasn’t the only one who had the same idea. The place was well occupied with adults and kids alike, some cozied up at tables with a good book, others accompanied with a son or daughter eager to check out their favorite title. Down the children’s isle, while checking out one of Beverly Cleary’s “Ramona” books, I heard a parent on the other side of the shelves ask, “How many times have you read that book?” Replied their little one, “Seven or eight times!” I smiled at this. Kid, I can relate, I thought. Sure enough, I’d let myself fall deep into the bowels of more than one book, and by the time I reluctantly trudged out of the library the street lights had turned on. Not good. There were still a couple more locations to visit before the end of the tour. Time to get moving… and quickly. Heading north on 41st Avenue took me back into residential territory once more. Walking past old horse rings and houses with garages squeezed into their yards led me to Stanton Street and eventually to 38th, and it is here that the homes took on a rather impressive quality. This is the site of “the ridge”, a huge hill of gravel dumped here many years ago by Ice Age flooding. It’s easy to see why it was taken advantage of. From its base to its peak, the location is rich aesthetically. The climb up to the top of the hill offered views of some of the cutest little homes you ever did see — it was as if they were pulled right from a fairytale book. No picture, in my opinion, could have done them justice. By this time the hour was waning on 6:00 PM. The tour was nearing its peak. And yet, there was one last stop to make on the way back to Grant Park. 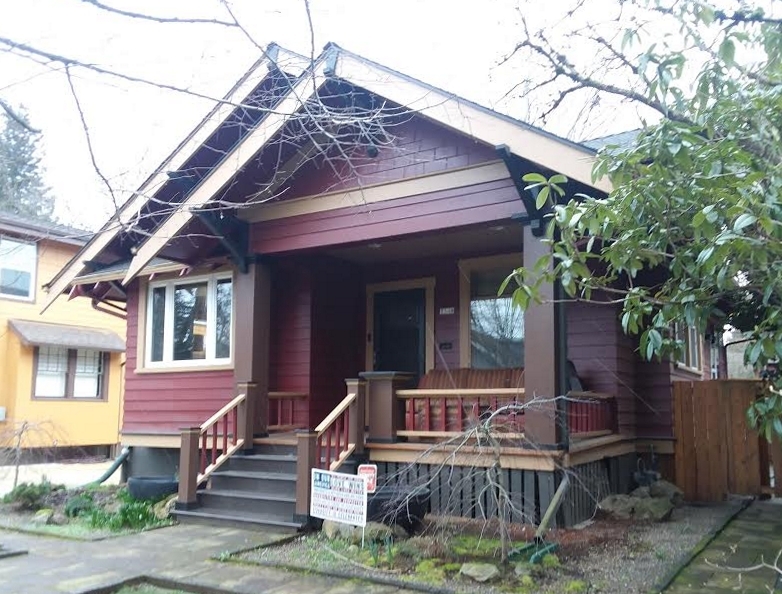 Returning to the bottom of the ridge, I traveled down 37th Avenue to gaze upon one last, significant house. 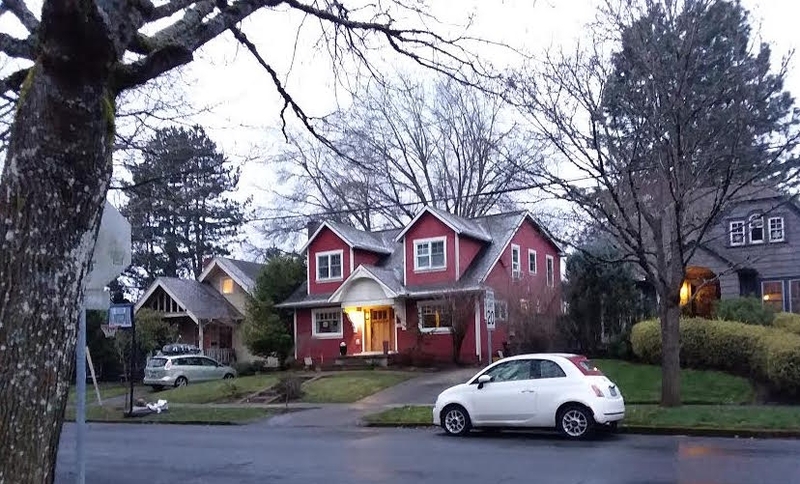 At 2924 NE 37th rests the home that Beverly’s parents purchased after having sold their farm in Yamhill. Memories both troubled and cherished were made in and around this abode, and, though it would have been a treat to explore it further, I contented myself with admiring the house from the outside. Not much further down the road lay Grant Park. 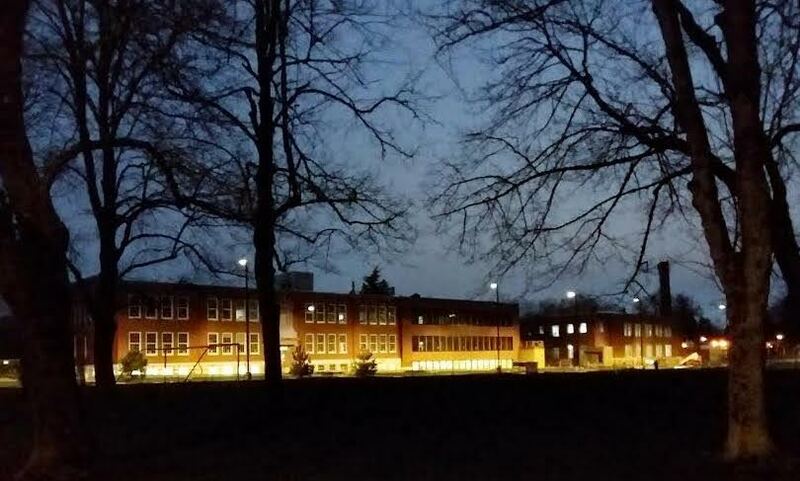 I decided to take one more picture of the grand facade, all lit up and aglow like a summer firefly (pic 18). Here the tour ended, but not before I was given a friendly farewell. Perhaps the spirit of Ribsy was following me around that evening, for I was sent off with a healthy dose of sniffs and kisses courtesy of two park goers’ dogs — a pleasant way to end the day! For those looking to extend their experience beyond the pages of Walking with Ramona, taking this tour with said book in tow is a great way to spend your day if you’re a fan of Beverly Cleary’s works, especially of the Ramona series. Unless you don’t mind the cold (and possibly snow), I’d highly recommend taking this tour in the spring or summer; at the very least, it gives you an excuse to stop for some ice cream at one of the local shops in downtown Portland. And if you’re looking to add some beautiful shots to your photo album then, by all means, take your camera. You’re gonna need it. This post was written by Spring intern Kellie Robinson. Follow Kellie’s work online, check out the book here, and learn more about interning at Microcosm in the FAQ,and learn more about Laura Foster in this recent Portland Business Magazine article.